Heat oven to 325°F. In medium bowl, mix cookie crumbs, peanuts and butter. Press evenly in bottom of springform pan, 9x3 inches. In large bowl, beat cream cheese until smooth. Gradually beat in sugars and vanilla until smooth. Beat in eggs, one at a time. Beat in 3/4 cup whipping cream. Pour over crust. Bake cheesecake 1 1/4 to 1 1/2 hours or until center is set; cool 15 minutes. Run metal spatula along side of cheesecake to loosen. Refrigerate at least 2 hours. In 1-quart saucepan, melt candy bars over low heat, stirring occasionally. Stir in 1/2 cup whipping cream until smooth. Cool slightly. Remove side of pan. 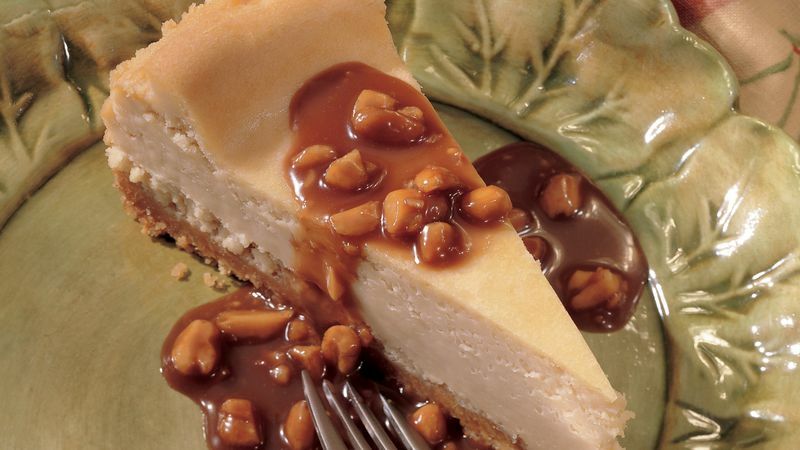 Serve sauce with cheesecake. Use crushed chocolate wafers instead of the vanilla wafer cookies. Make sure you beat the cream cheese with an electric mixer on medium speed until it is smooth before adding the remaining ingredients.